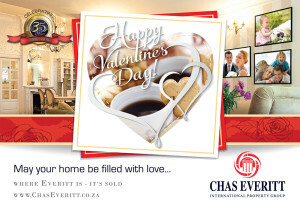 The Rondebosch blog and Chas Everitt wish our Rondebosch residents a happy Valentines Day. The most important things in the world to do are to get something to eat, something to drink, and somebody to love you. You dont love someone for their looks, or their clothes, or for their fancy car, but because they sing a song only you can hear. Whatever else is unsure in this stinking dunghill of a world, a mother’s love is not. Love will heal what language fails to know. It often occurs to me that we love most what makes us miserable. In my opinion the damned are damned because they enjoy being damned. How can a woman be expected to be happy with a man who insists on treating her as if she was a perfectly normal human being. Seamus Heaney – meaning ‘dont be afraid’. These were the last words the poet sent to his wife, just before he passed away. Gravitation can’t be held responsible for people falling in love.